CHECHESMITHNATION : Cynthia's Cathedral Veil... So Fit For A Princess! Cynthia's Cathedral Veil... So Fit For A Princess! 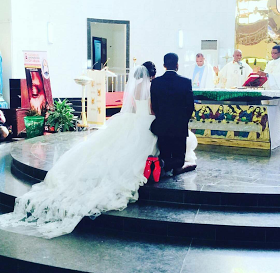 The newest Couple in town, Ebuka and Cynthia, taking their vows. Cynthia's Cathedral veil is so gorgeous, while her boo slays-on as he flashes the Louboutin's World bottom on us.